The great epiphany of Hawkman by Venditti and Hitch – AiPT! Hawkman’s latest issue completely changes the game and re-contextualizes the story so far. Hawkman has been journeying across time and space, reuniting with prior incarnations of himself. He’s driven both by the desire to unveil the truth of his own history and the need to stop the threat of The Deathbringers, a cosmic and immortal order of world-killers. To date, he’s met three of his past incarnations, briefly slipping through time and space when in contact with relics or remnants from his old lives. The first meeting was with Prince Khufu Maat Kha-Tar of Ancient Egypt, the life many until quite recently assumed was his first. The meeting was triggered by an old artifact in a museum, with a ‘blur’ pulling Carter Hall, Hawkman, away whilst light surrounded him to indicate the time slip. The meeting went poorly, at least at the start. Khufu engaged Carter and the two dueled before coming to a halt, with Carter being pulled back after he learned what he needed to keep going further on his quest for answers. The next and second meeting happened with Katar Hol, the Thanagarian Cop. Carter entered a planetarium projecting the Thanarian night sky and slipped once more, with a blur and a light, to a time before. Dressed in the iconic Tim Truman Hawkworld outfit, Katar, much like Khufu, engages Carter and does so even more brutally and relentless, as is expected of the Hawkworld hero. Carter is forced to hide until he finds his answer once more and he does so in the legendary Hawkworld statue of Kalmoran, after which he returns. Both were fun bits of storytelling and served as a neat, if ambiguous, bit of storytelling to have the hero go through his history quite literally, allowing readers to familiarize or in some cases re-familiarize themselves with both the past and present of Hawkman and how they contrast and compare. But the latest and third meeting in issue #8 of the series completely changes the game and re-contextualizes the story so far. Carter arrives at Krypton, in the hopes of retrieving a weapon that may help him beat The Deathbringers. Slipping through time and space once more, he meets Catar-Ol, his Kryptonian counterpart, who is amongst the fresh personas invented for this particular series. Catar is a wise historian of Krypton and unlike the other two, he has far more awareness of his past and isn’t shocked at Carter’s arrival. Right than a duel, the entire issue is a conversation between two men. Following the heavy and massive issue #7, packed with secrets of Hawkman’s first life and true origin, we see Carter trying to grapple with his past and future alongside Catar-Ol. Hawkman has learned that in his first life, he was Ktar Deathbringer, the immortal leader and general of The Deathbringers, until he betrayed them and sealed them away, dying the first time in the process. Offered a chance at redemption in the divide between the realms of the living and the those past by a greater power, he was granted a choice: Rest for good, or be reborn eternally until he has saved as many lives as he was responsible for killing, after which his power of rebirth will cease. Now on a doomed world, Carter hopes the answer to his salvation will lie in the weapon he has come for. Only, it is dashed, with the weapon being simply an ineffectual tool that does not work and is far too large to transport. Now, as doom’s gripping, both literally and figuratively, grows stronger around their world, Carter and Catar talk. They talk about the one thing they know and find comfort in: History. Pausing to think, Catar responds to this by informing Carter that he himself is the solution to the problem. And that when the time comes, he must become the weapon in the hour of need. He’s the very history of the DC world, so he must apply his knowledge of history to the future. For what use is the past if it does not help us in our journey for the future? After all, he is no longer a Deathbringer. The Deathbringers repeat the mistakes of history, while Hawkman is built on learning from it and applying it to push forward to the future. And with that answer, Carter feels the blur and the light once more. He still has no idea how to solve the problem and so he reaches out to touch Catar one last time. But in doing so, he finds that, as they’re touching, both of them are transported back to current time, which is an utterly bizarre and shocking development. Once they stop touching, however, Catar soon returns to a doomed Krypton and dies. These are massive revelations that re-frame the entire story and allude to astonishing future developments in the series. What seemed to be a simple narrative device and framing tool for the story thus far becomes huge foreshadowing and teasing a massive secret. Hawkman doesn’t simply time-slip to moments without clear reason, he’s reconnecting with the disparate parts of his consciousness. Parts which he can now ostensibly call on, as his memory begins to rebuild once more. Though he isn’t fully quite aware of it, Hawkman has an utterly distinctive and mighty ability, which is what he has been utilizing in the story so far, without any understanding or knowledge of its existence. As the living historical document of the universe, he can call on any incarnation of himself across the ages to whatever place and time he wishes, as the theory puts it. He need only connect with the memory, the history of it, the part of his consciousness that very much was part of it and he can instantly be transporter, for a brief period. Like Catar-Ol in this issue, every part of him still exists within him, in memory, in his history and he can, both figuratively and quite literally use them. That’s a gigantic addition to the Hawkman character and mythology and it heralds big things. This is where the additive approach of Venditti and Hitch really roars with its might. What they’ve brought to Hawkman is an ability unlike anything or anyone else. None of his immortal hero brethren across any world share his skill. In fact, it’s hard to think of any character with such a talent. It’s something utterly idiosyncratic to Hawkman, an addition specific to him and no one else. It makes him not only a unique hero in all of DC Comics but in all of superhero fiction. It literalizes all his greatest strengths and perfectly captures everything he is and represents in his powerset. What could’ve been a simple throwaway framing device is not and utilized as part of a meticulous narrative that’s all-inclusive and ever-reaching. Hawkman got his answer and Catar, on some level, understood innately what Carter is about to soon. If #7 showcased his lowest point, his pain and suffering, #8, despite the doom that surrounds things, is a high point, a spotlight of what truly makes Hawkman special in the face of all the lows. But to state it all in blunt terms, what this really means is this: when the moment arrives, Hawkman can summon every Hawkman to have ever existed across all of time and space, should he want to and prove able. 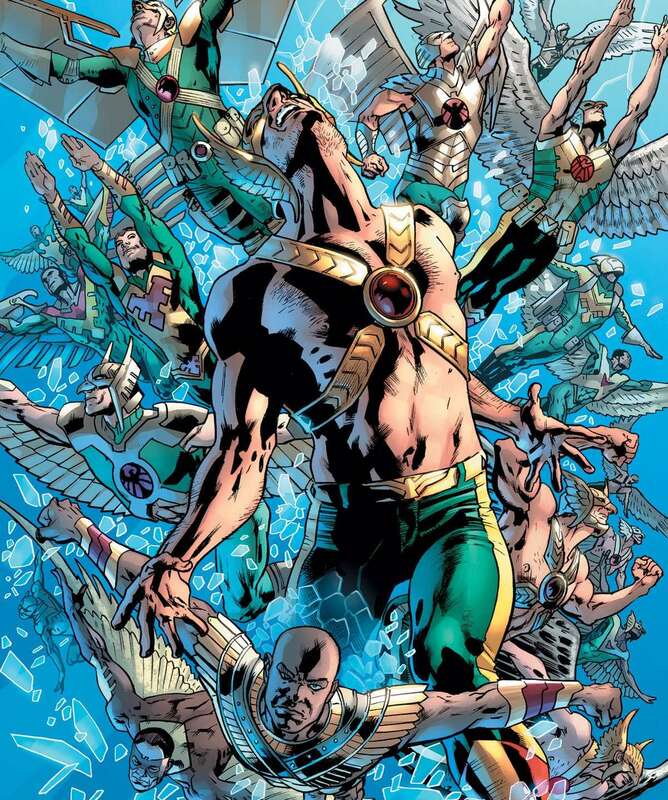 It’s setup for the grand payoff of everything the creative team has been building up since #1 and it hints at an epic finale unlike any we’ve ever seen in Hawkman or DC history. In the face of Death, that the Deathbringers stand for, there can only be one true weapon of victory: Life. And despite all his deaths, what is Hawkman across the ages if not the ultimate Lifebringer? It’s the ultimate truth we’ve all known about the hero for a long time and in Venditti and Hitch’s Hawkman, the humble hero must come to the same conclusion. He need only embrace his epiphany to unlock that which has been there within him since the start. Only then can he ascend and finally soar, free in the skies, unburdened and at peace at last. Hawkman #8 is out now!